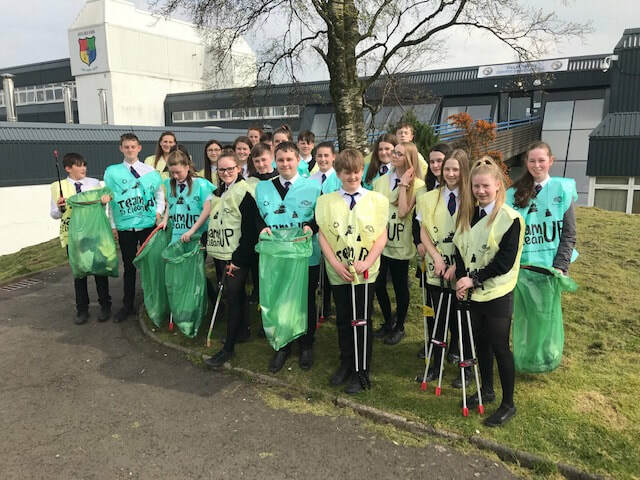 Thursday 18 April - Some of our S2 pupils out litter picking this afternoon in order to ensure a litter free start to the Easter Holiday long weekend. We wish you a very Happy Easter, hopefully in lovely sunshine. ​Thursday 18 April - The sun shone at the right time today for our S1, S2 and some S6 pupils to walk to Freeland Church in Bridge of Weir for their Easter Service. Rev. Kenneth Gray and Rev. Hanneke Marshall led the service, with pupils helping out and also providing beautiful music. Thursday 18 April - Very well done to the pupils who received Awards at our annual Awards Ceremony last night. 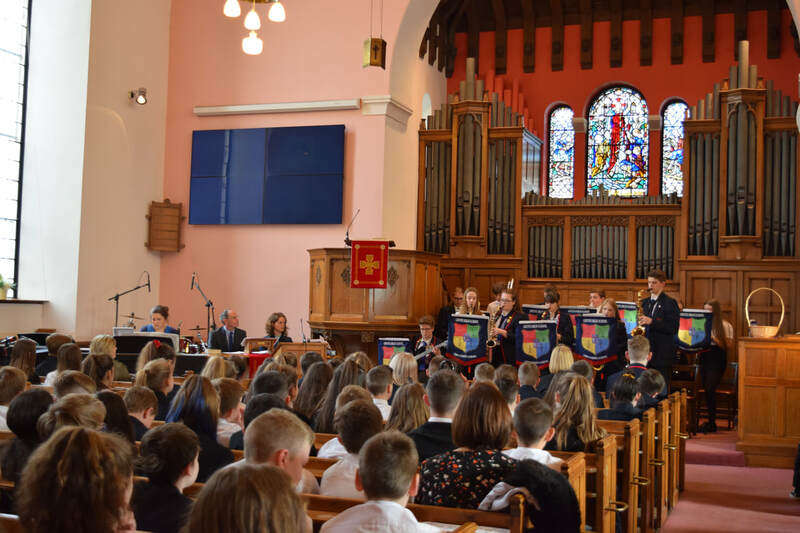 More than 550 awards were presented for a vast range of both academic and wider achievement, with the main focus on pupils excelling in giving their best. Guests presenting the awards were former Head Girl and Boy, Emma Harper and Calum Sheils, as well as Mr Steven Quinn Acting Director of Education / Chief Education Officer Children Services. We are extremely proud of ALL of our pupils. Wednesday 17 April - For parents/carers attending tonight's Awards Ceremony we would ask that you please remember to bring your tickets with you. With this being such a busy night we will need to ask all parents/carers without a ticket to queue until others with a ticket are seated. At 6:50pm we will allow all in on the understanding that the seating availability may be limited. Wednesday 17 April - Please read the attached letter which gives some detail regarding the measuring of Blazers for current S2, S3 and S4 pupils during lunchtime, and periods 6 and 7, tomorrow Thursday 18 April. 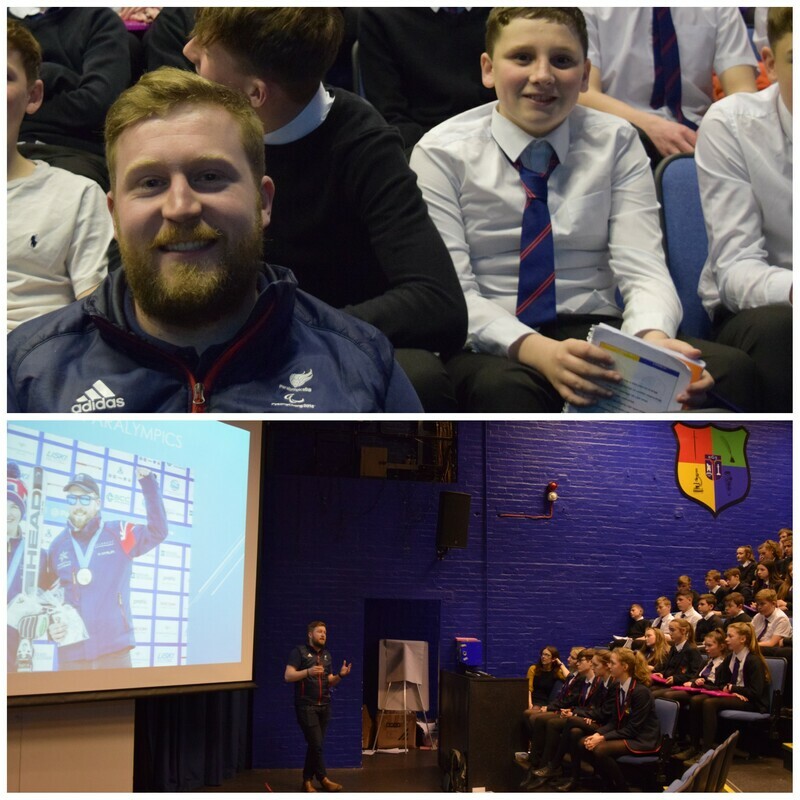 Tuesday 16 April - S1 to S3 pupils were treated to an inspirational guest this afternoon in their House Assemblies. Former pupil Brett Wild is a submariner for the Royal Navy. Brett has been given time to be a guide for skier Millie Knight and they won 2 Silver medals and a Bronze medal at the PyeongChang 2018 Paralympic Winter Games. This was in the Downhill, Super-G and Slalom. Brett brought his medals in for pupils to see and he also gave pupils some very good advice about maximising the opportunity that they have at Gryffe. ​Brett has realised his dream and inspires all pupils to do the same. 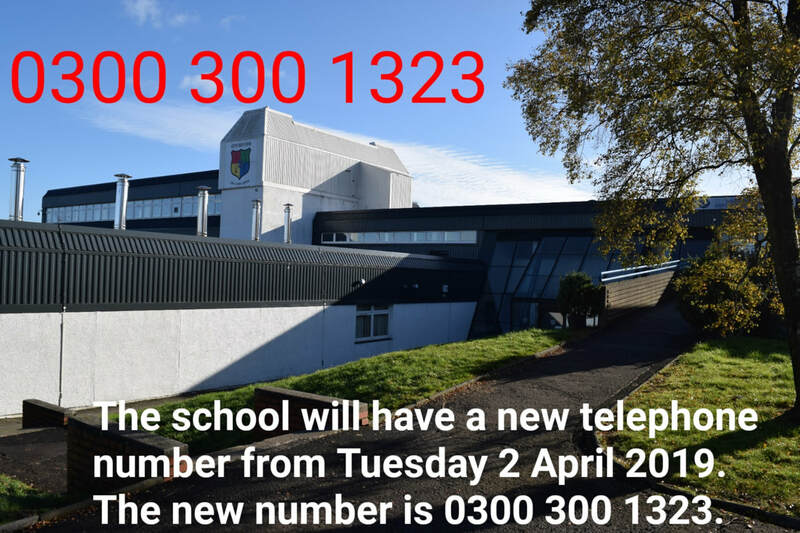 The school will have a new telephone number from Tuesday 2 April 2019. The new number is 0300 300 1323. The old number will operate as normal for a few days after 2 April but will be removed thereafter so please use the new 0300 number. Wednesday 27 March - S4 Youth and Philanthropy Initiative finalists battled it out today in a bid to win £3000 for their chosen charity. The winners, from a strong field, represented the Ubuntu Women Shelter. Congratulations to Simran, Esme, Aliya and Catherine in the winning team. Well done to all involved and thank you to our judging panel - what a difficult decision to make! Tuesday 26 March - Attached is a letter for S4, S5 & S6 Parents/Carers regarding SQA Examination Study Leave. The first day of Study Leave for all 3 year groups will be Monday 29 April. 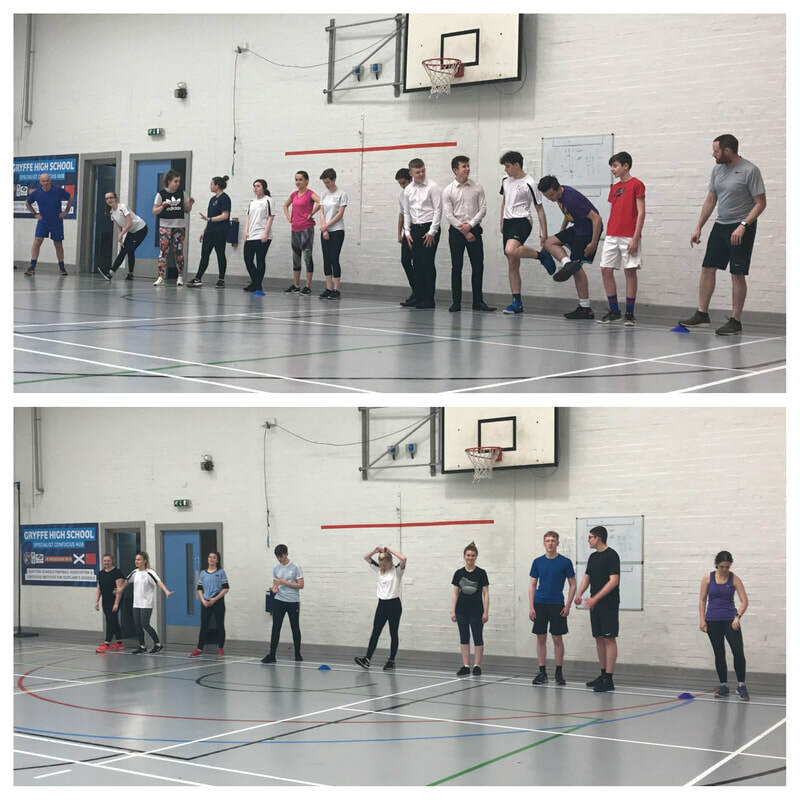 Friday 22 March - As part of the preparations for their upcoming trip to Bolivia in June, World Challengers yesterday completed a fitness test to ensure that they are fit for travel. Mr Johnson, who was not only keen to support the pupils taking part, but also not one to pass-up on a challenge (presented to him by one of the S5 pupils) also took part. Let’s just say that said S5 pupil may think twice about challenging again!! Well done to all pupils. The Countdown to expedition is well and truly on with less than 12 weeks until departure. 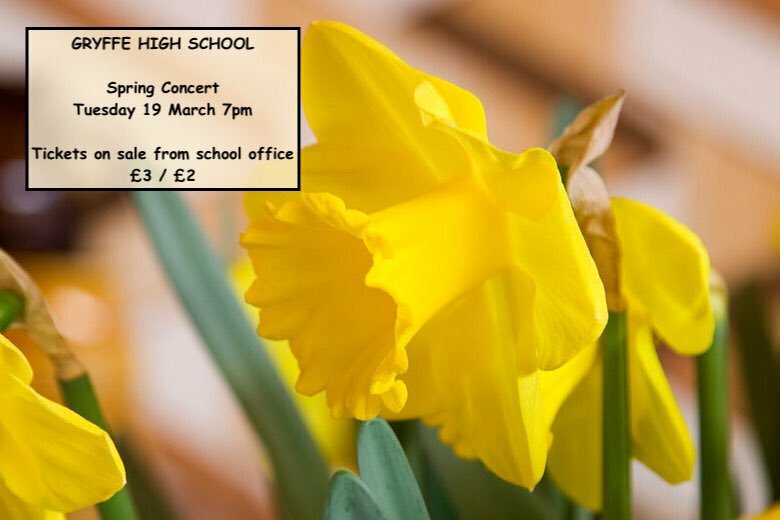 Thursday 21 March - The video compilation of the Spring Concert has now been added on the school YouTube channel. Enjoy! 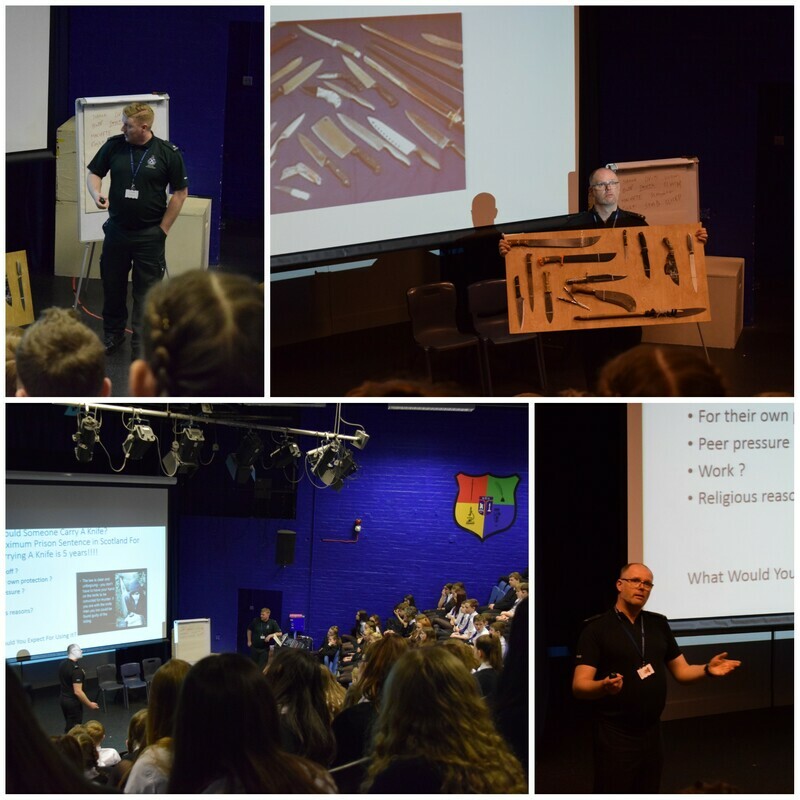 ​Wednesday 20 March - All S1 to S3 pupils took part in very informative Knife Crime Awareness Assemblies today, delivered by PC Gordon Aitken of Police Scotland and Paramedic Brian Forbes of Special Operations Response Team (SORT). Pupil feedback has been very positive. 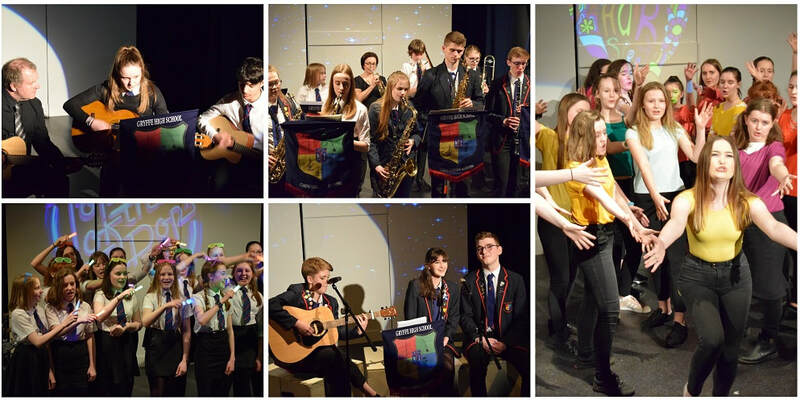 Wednesday 20 March - Pupil talent was brimming in last night's Spring Concert with bagpipes, Concert Band, Jazz Band, String Ensemble, Guitars, Young Musician Winners, Senior Vocalists, Hairspray and the Choir. The audience sat back, relaxed and enjoyed! Well done to everyone involved, not forgetting all the pupils who worked behind the scenes. Tuesday 19 March - Pamper Night 22 March cancelled . On behalf of the PTA, I regret to inform pupils and parents that due to very poor ticket sales we have taken the decision to cancel this event. I would like to thank local salons and therapists from DIVAH SALON ,SO Beauty Lounge & Julie Devine Hair And Tan as well as students from West College Scotland for their support alongside the many artisan gift Vendors who had pledged to come along on Friday evening . If you had purchased tickets please visit the school office for a refund . 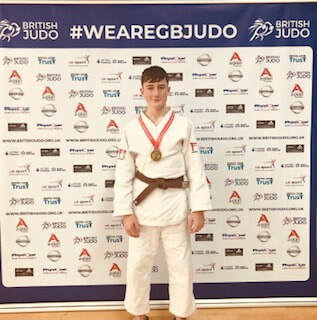 Monday 18 March - Huge congratulations to S3 pupil Matthew Sweeney who represented Gryffe High School at the 2019 British Schools Judo Championships in Sheffield and won GOLD! This was in his category of U66kg. Amazing news Matthew - very well done! 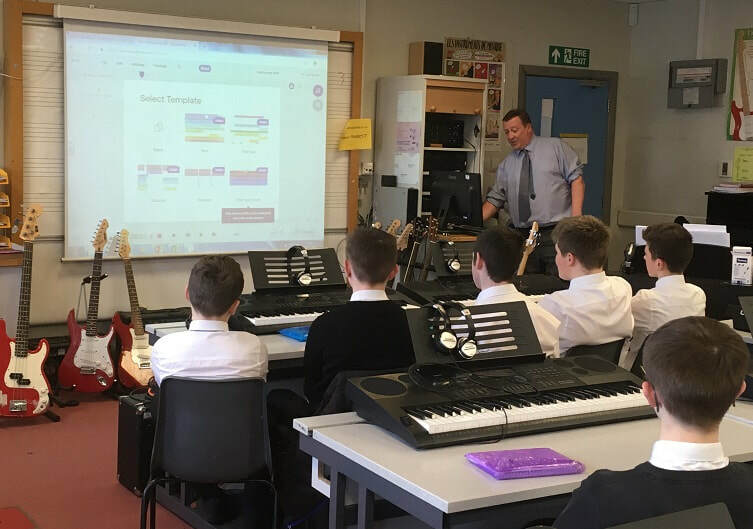 ​Monday 18 March - Alan Cameron from ‘Soundtrap’ visited our S3 music classes last week to demonstrate the online composing tool Soundtrap; a collaboration platform for making music online. Our S3 pupils were engaged and thoroughly enjoyed the enthusiastic presentation. We look forward to working with Soundtrap over the coming months and to hearing some fantastic compositions from our pupils. Wednesday 13 March - Our Junior and Senior Pupil Councils met this morning to discuss progress over the session. 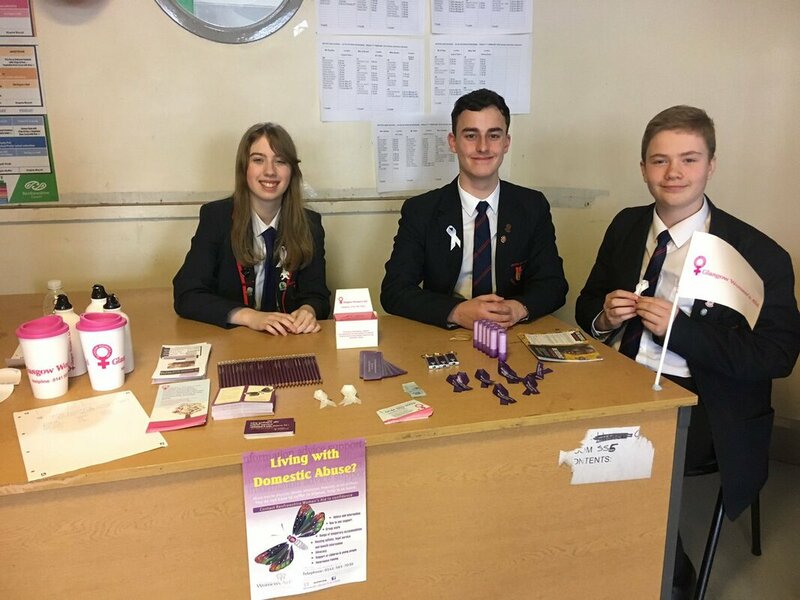 Led by School Captains Shaun and Matthew, they discussed actions from previous Pupil Council meetings as well as from the weekly Pupil Management meetings. Potential focuses were highlighted to take forward for the remainder of this session and into next. Well done to all that have contributed to the Pupil Council this session, meetings have been highly productive with pupils using the opportunity to voice their opinions. Tuesday 12 March - Pupils from 1M tried their skills working with BBC iReporter today in Social Subjects. 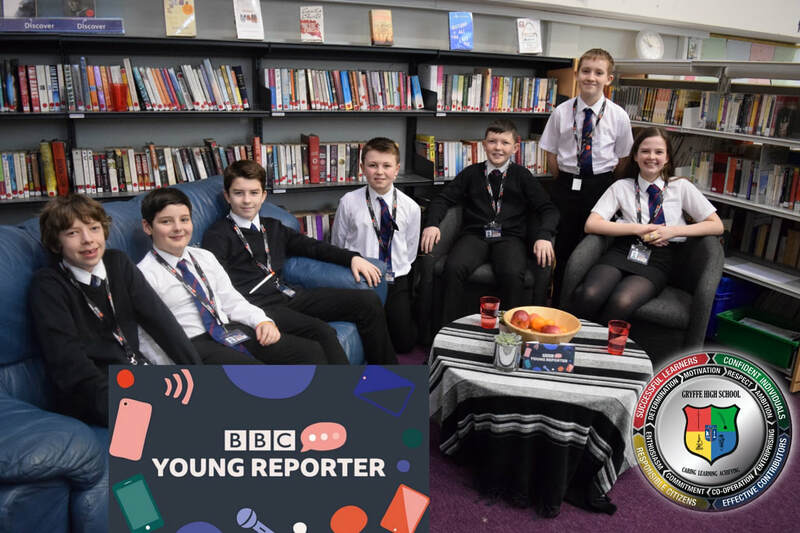 BBC have launched a simulation where pupils pretend to post on the BBC Live feed. They are ranked on their speed, accuracy and impact for their contributions. As you can see, they were quite engrossed in the task and really enjoyed the challenge. 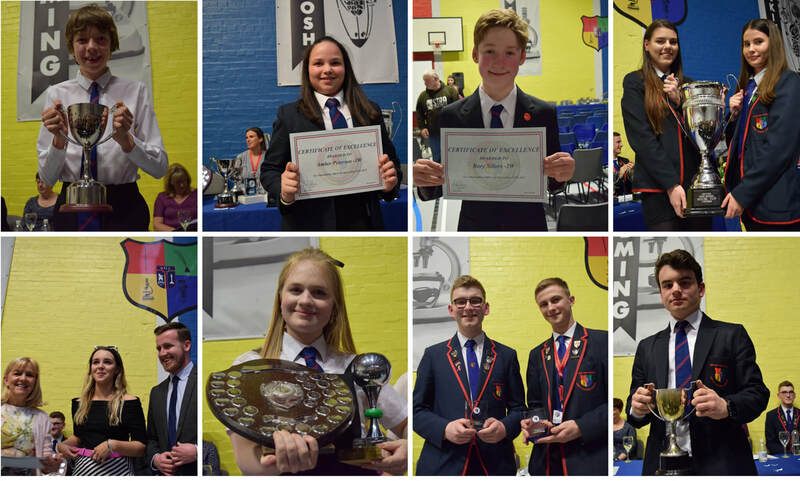 Monday 11 March - To all year groups - We do our best to keep up with the many sporting achievements of our pupils and would like to recognise these achievements at our Annual Awards Ceremony in April. We are keen to ensure that no-one is overlooked in this respect. 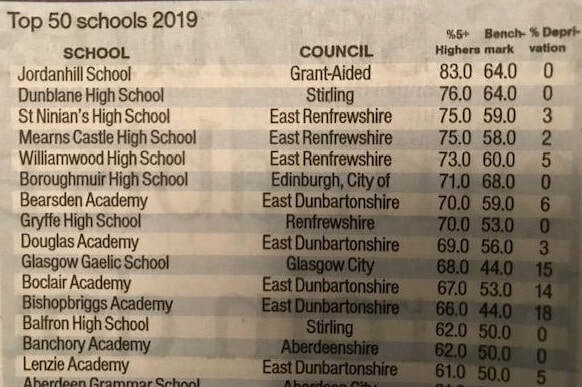 Please let Mr. O'Hare know by emailing the school (for his attention) on gryffehighenquiries@renfrewshire.gov.uk if you have either been an Internationalist or have been a Winner at National Level in your sport in the past year. Please include brief details of the achievement. Thank you. 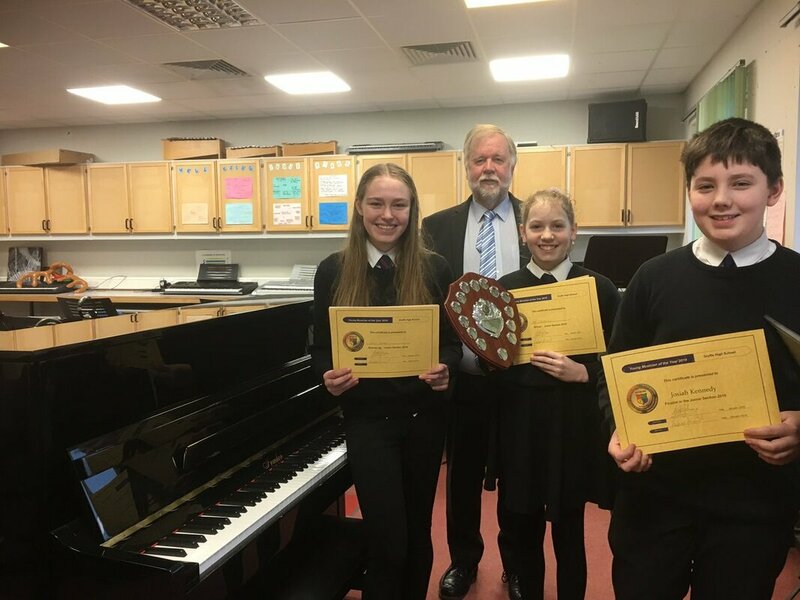 Thursday 7 March - Our Junior Young Musician final took place yesterday with our Senior pupils being the audience and Mr Andrew Laird adjudicating. All pupils performed with accuracy and flair, demonstrating a very high standard for this category. 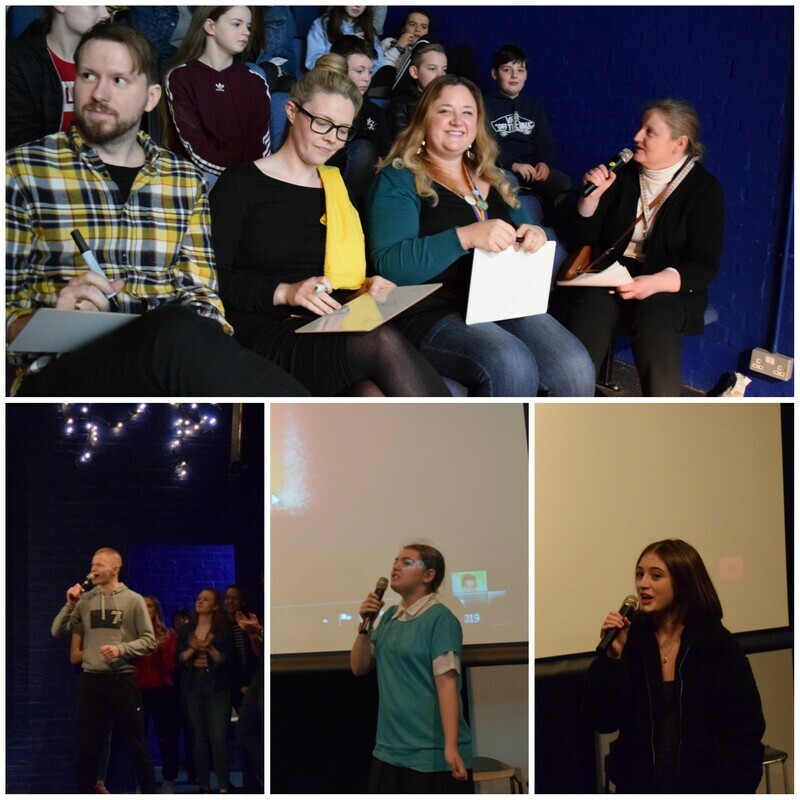 Finalists were Josiah Kennedy S2, Amy Spearing S1 and Lucy James S2. Amy took the title of Junior Young Musician of the Year. Very well done to all our finalists. 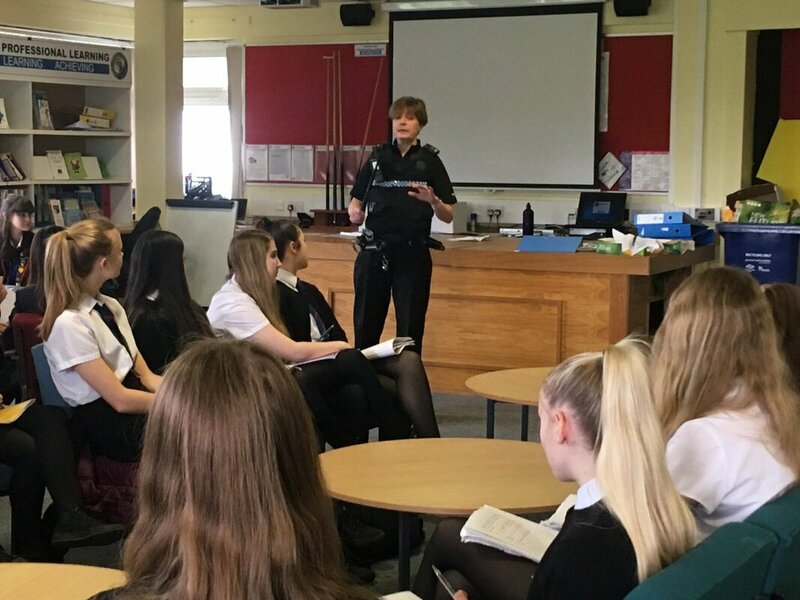 Thursday 7 March - We were delighted to welcome 'Scotland’s Police Officer of the Year' in today to Modern Studies, to answer questions with National 5 and Advanced Higher pupils. Constable Kirsty Boyd - known locally simply as 'PC Kirsty' is a Gryffe parent and former pupil. 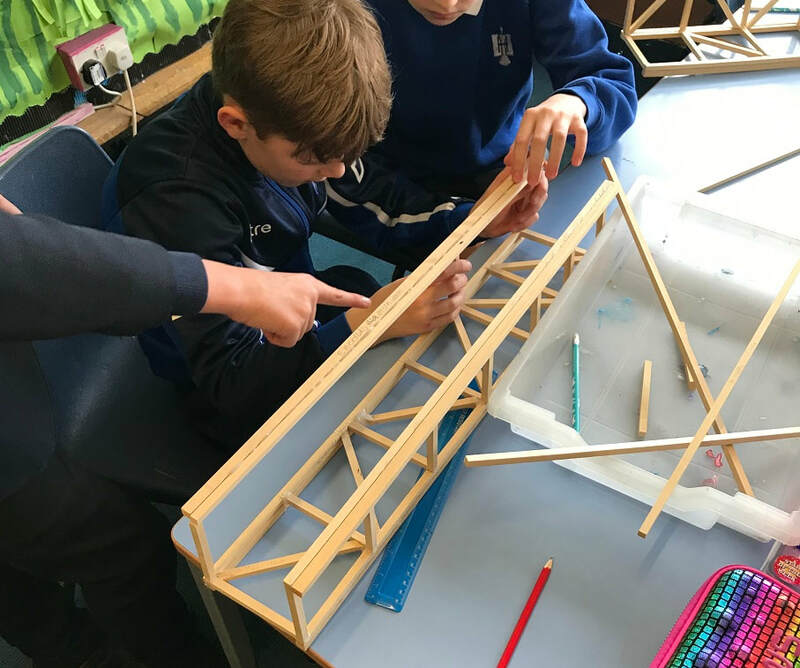 Thursday 7 March - S2 pupils visited Houston Primary School today to help with the P6 Bridge Building challenge. The pupils had a great time and were fantastic at helping with the challenge! The parents, pupils and teachers were full of praise. Well done to everyone! Thursday 7 March - Some pupils from the Citizenship Committee visited Mary Russell School today to hear a talk from the Managing Director of the Sholi Coffee Cooperative in Rwanda, Aimable Nshimiye. We learned about the coffee growing process and the benefits Fairtrade brings to the producers. This is all part of Fairtrade Fortnight events. Wednesday 6 March -The MARCH NEWSLETTER, has been uploaded and can be found under the 'NEWS' tab, then 'Newsletters'. 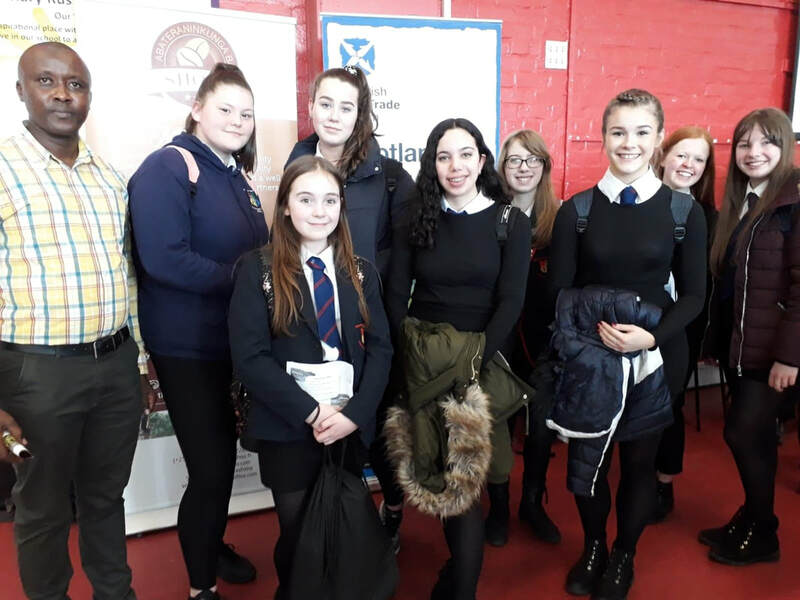 Tuesday 5 March - Ten of our S2 pupils (balloted from pupils who indicated an interest in the event) attended a STEM event at West College Scotland in Paisley today. 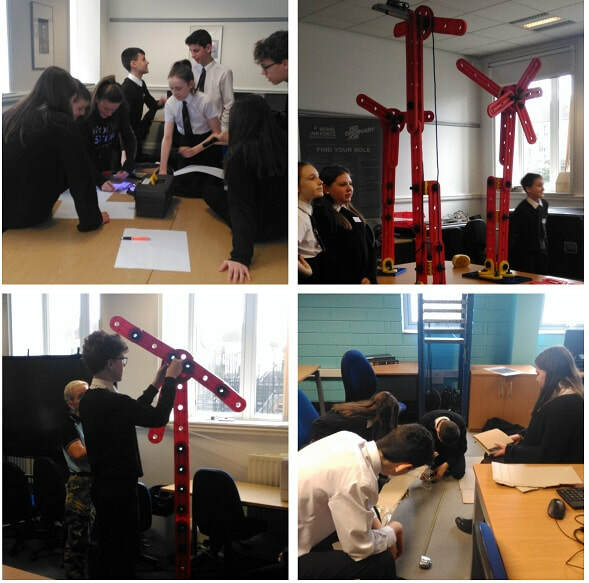 The day included interactive workshops, speakers and role models within the STEM sector. Pupils enjoyed participating in the challenges and a great day was had by all. 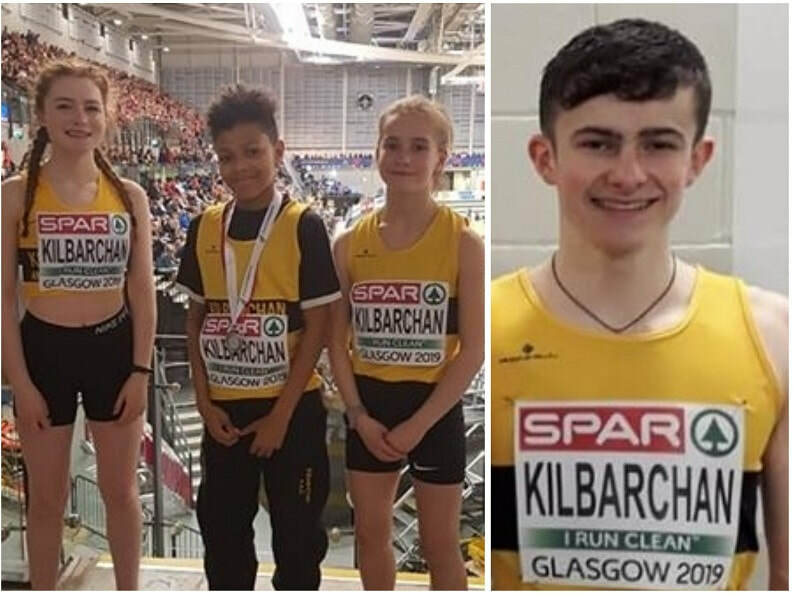 ​Friday 1 March - Excellent news from the 2019 European Athletics Indoor Championships tonight at the Emirates Arena for Caleb, Sarah and Grace. Caleb's Kilbarchan AAC team took SILVER - very well done!!! The girls also had a fantastic run and their team came in a close 5th. There was also SILVER at Senior Level for S5 pupil Matthew Cliff as part of the U17 Boys Relay Team. ​A great experience for them and a chance to meet many other athletes. 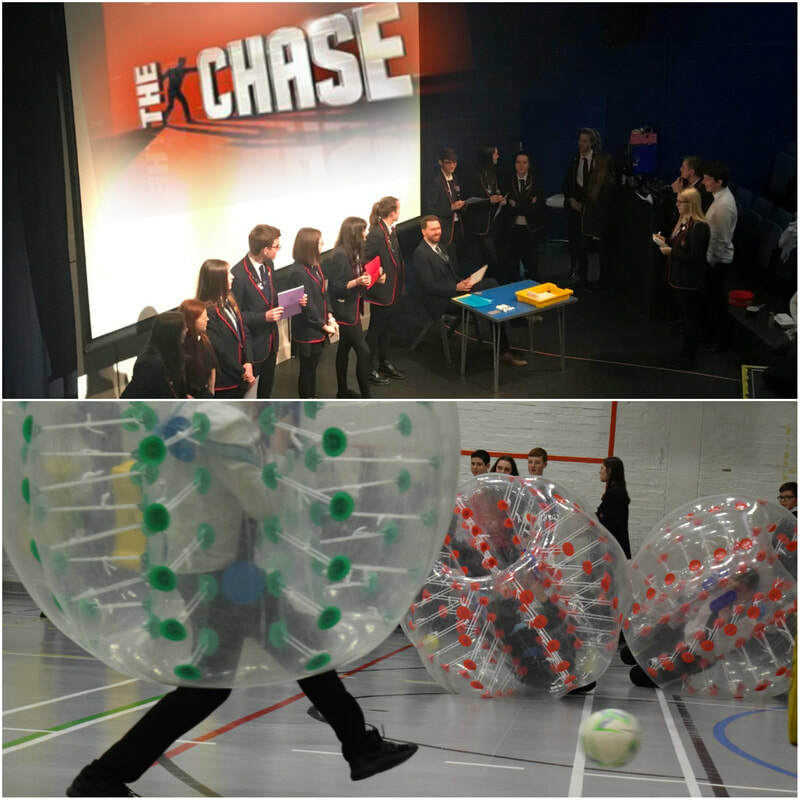 Friday 1 March - S3 pupils were introduced to their tourism Apprentice Challenge yesterday. A lot of motivational words to get the thoughts going - watch this space over the next 8 weeks. 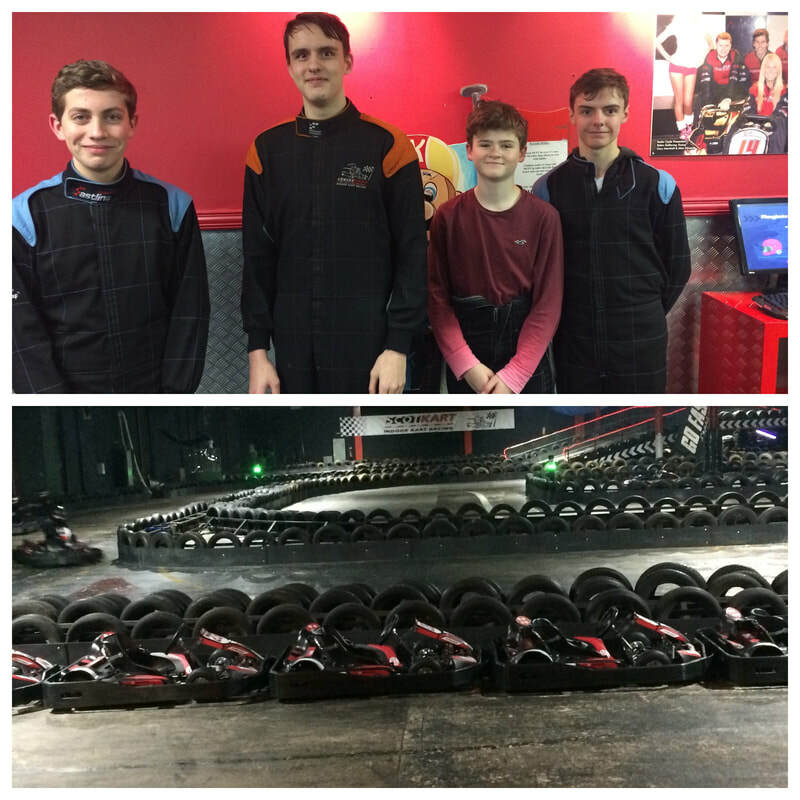 Friday 1 March - S3 and S4 pupils Steven Barclay, Shaun Lynch, Alex McKay, Fox Harris and Gregor Hewitt attended the British Schools Karting Championship this week. 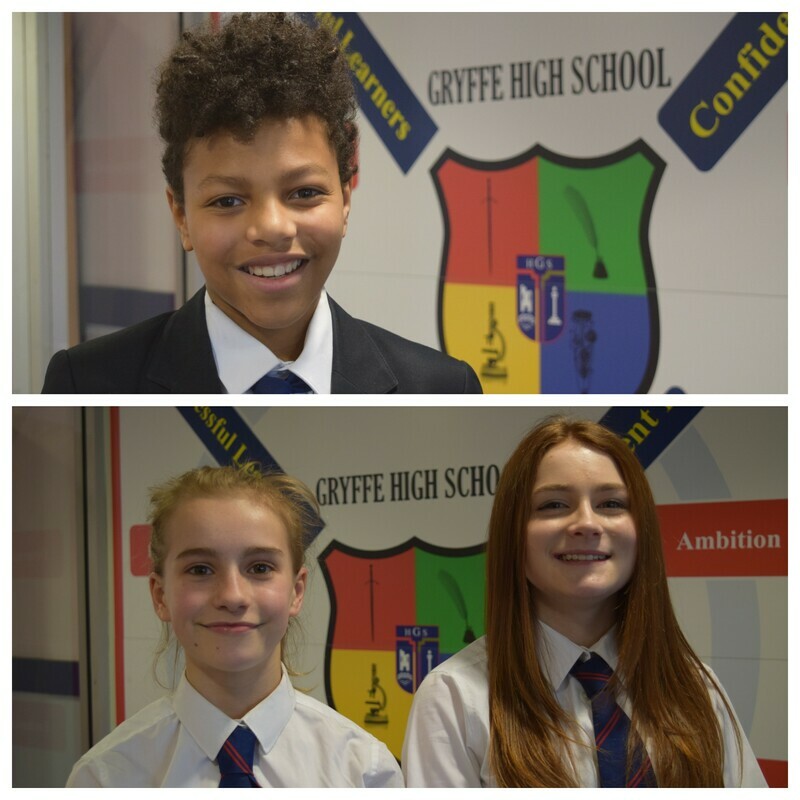 The two teams from Gryffe competed against three other schools across Scotland in 10 minute races. Great fun was had by all! And some good finishes too. 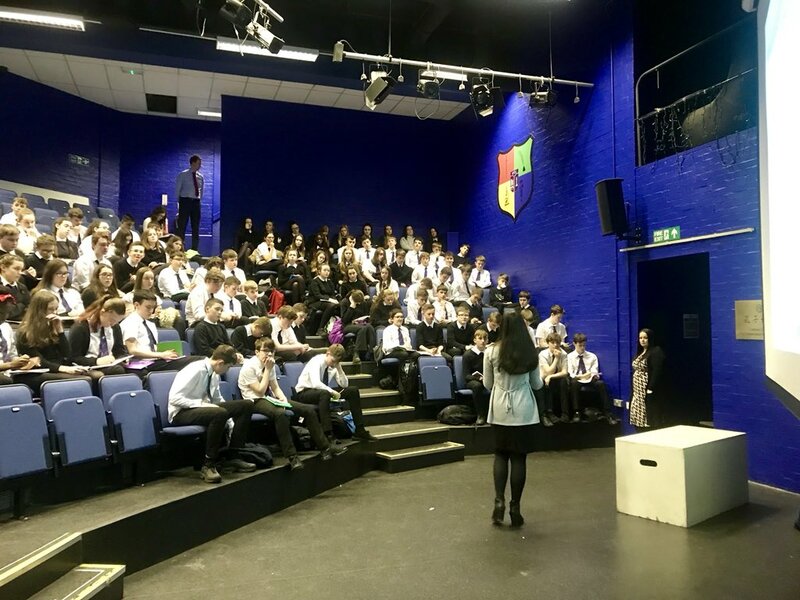 Wednesday 27 February - We held our S2 Parents in Partnership ‘Re-Connect’ event today. This brought together our group from the PIP initiative in 2017/18. 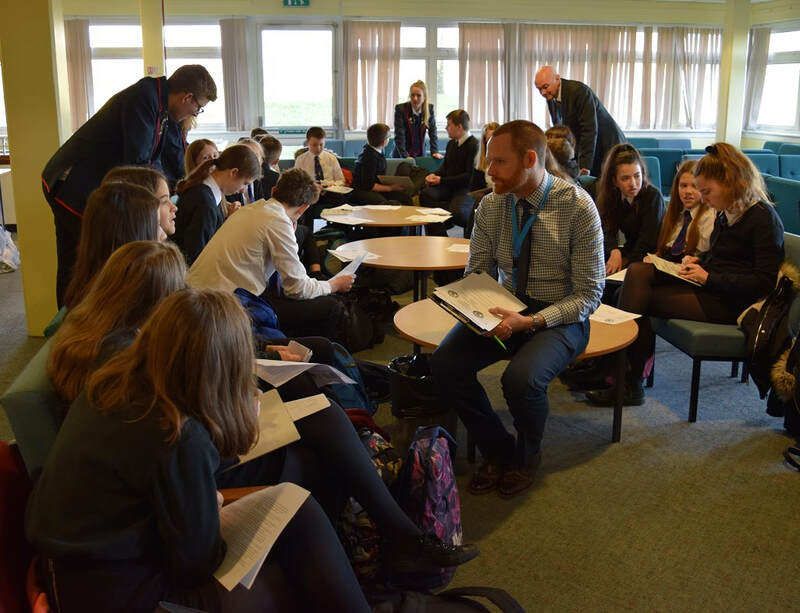 The event focused on the S2 options process with inputs from a number of staff to promote the wealth of information available to parents and pupils regarding their subject choices. Mr Anderson and Mr Findlay would like to thank the parents for attending, as well as the staff who presented to the group! Wednesday 27 February - S1 pupils, Caleb Murray, Sarah Lyle and Grace McColgan were involved in the Relay Races at the Emirates Arena and their teams qualified for the European Championships that will also be held there this weekend. This is an amazing achievement. Caleb will be part of the U13 Boys team and Sarah and Grace U13 Girls team. They will all now be taking part in the Final of the 4 x 200m Club Relay on the evening of Friday 1st March. This event has been included in the programme of the opening night of the European Athletics Indoor Championships Glasgow 2019. We wish them all the very best, but no matter what, qualifying is a great achievement in itself. 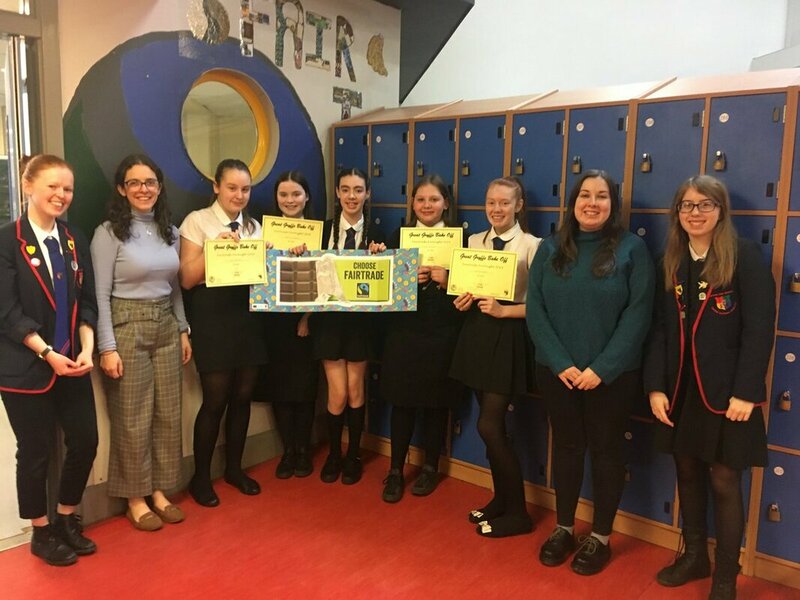 Friday 22 February - Pupil Voice would like to say a massive well done to our fantastic House Captains for organising all of our events this week! And thank you to all the pupils who participated throughout the week! Today we had a busy lunchtime Karaoke and then House photographs. 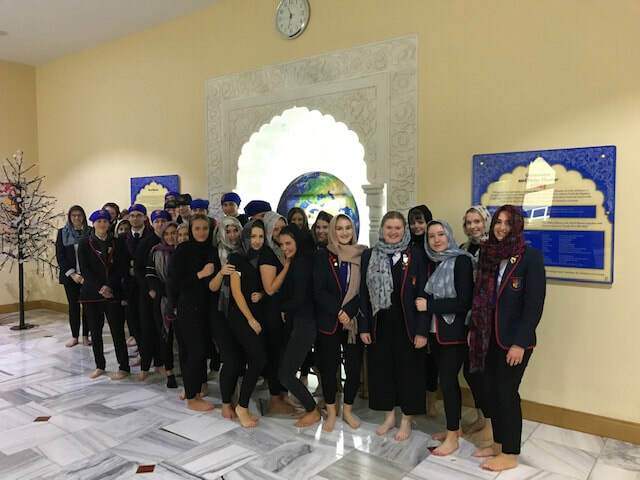 Wednesday 20 February - The RMPS Higher class went to the Central Gurdwara in Glasgow yesterday to deepen their understanding of Sikhism. We were given an excellent tour and were invited to have a meal in the community kitchen (langar). 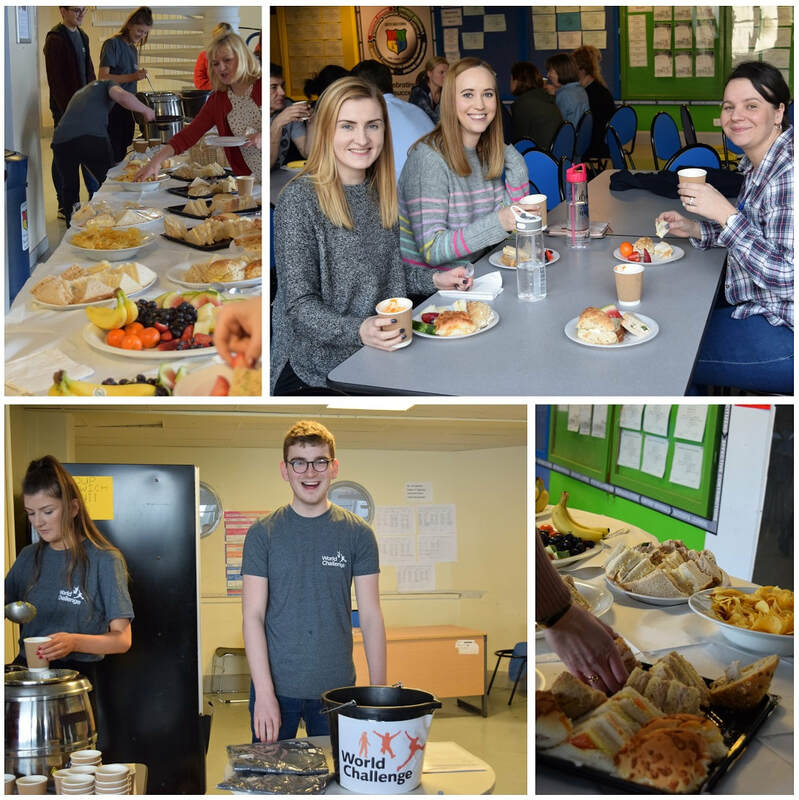 Wednesday 13 February - Thanks to Shaun Sweeney, World Challenge Team, who provided a splendid, healthy lunch for staff today to raise funds for the trip in June. The lunch tied in well with Health and Wellbeing Activities that staff took part in just before lunch. The In-Service day started with an interactive session on 'Teacher Led Improvement' with Mr Ian Fraser, followed by a presentation and discussion groups on 'Promoting Positive Relationships'. The rest of the day was spent in Departmental Development work for CfE and National Courses. 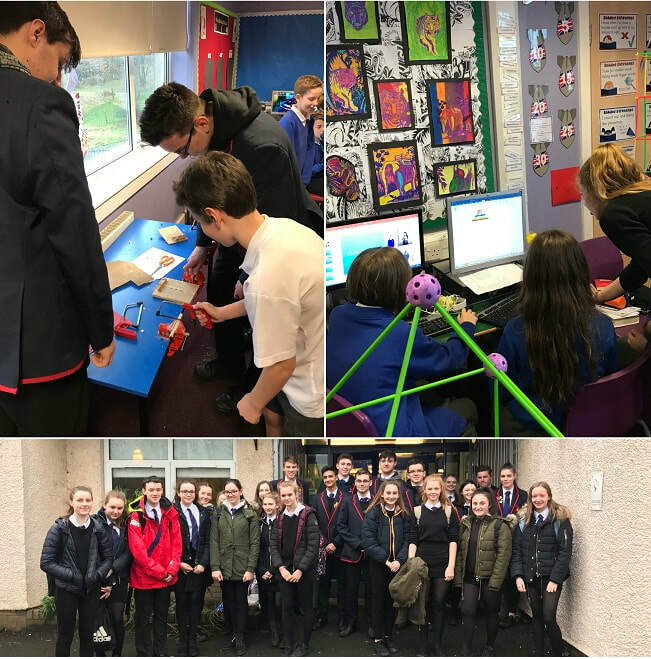 Friday 8 February - A group of 21 S3-6 pupils from the Design & Technology subjects attended Houston Primary School to help with the P7 technology challenge. Everyone thoroughly enjoyed participating in the various tasks and the Houston Primary School pupils were very appreciative of the help! ​A great time was had by all. Thursday 7 February - Lucy Anderson 2Fm, has been working tirelessly to support her mum Catherine in raising money. This is to help fund future treatment to help her mum who sadly has cancer. Lucy took part in the fashion show at the ladies afternoon tea in December which raised £4,800. 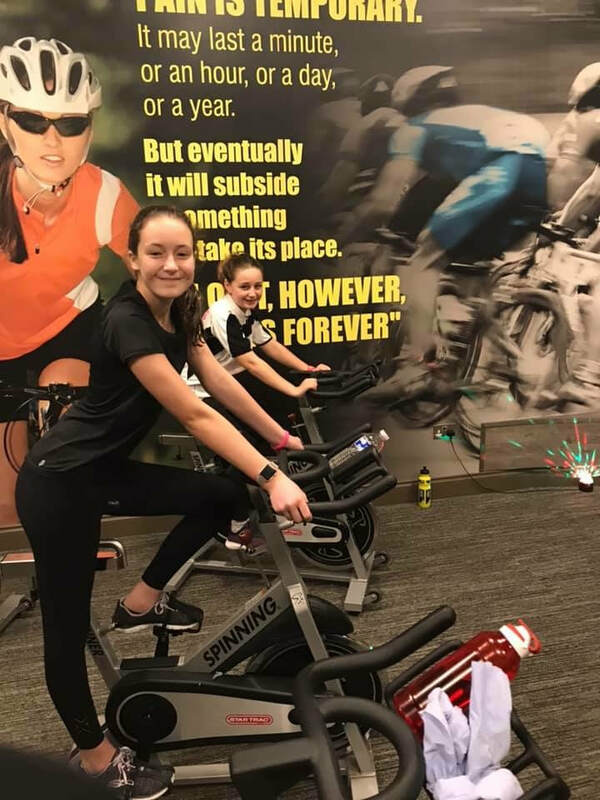 She also participated in the super spin day in January which raised £1,700. Lucy is now training to run 5k in April as a running event is being organised around the local villages. Lucy’s mum said ‘Lucy is a great support to me and works hard to help raise money.’ Very well done Lucy. Wednesday 6 February -The FEBRUARY NEWSLETTER, has been uploaded and can be found under the 'NEWS' tab, then 'Newsletters'. 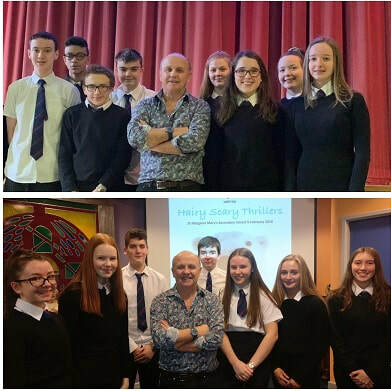 Tuesday 5 February - S3 Geographers had an amazing opportunity to meet Scottish wildlife and expedition documentary cameraman Doug Allan. They learned all about his work in the Antarctic and Arctic, and the impact that climate change is having on these regions. Friday 1 February -The Senior Phase Options Booklet has been uploaded and can be found under the 'CURRICULUM' tab, then 'Senior Phase'. 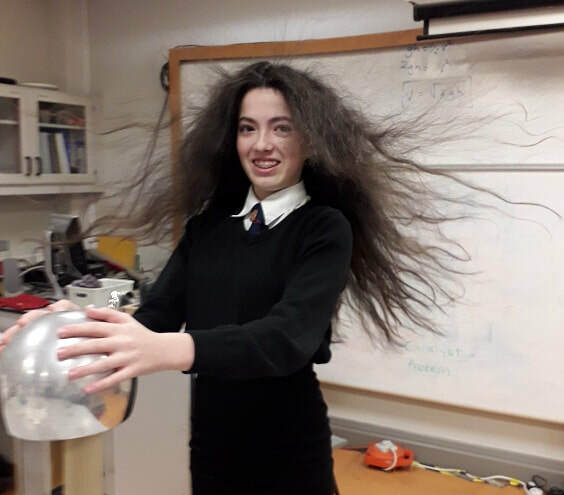 Friday 1 February - It is Van de Graaff time for S2, who have been learning about Electricity and Energy. Thanks Catriona for being a willing volunteer! 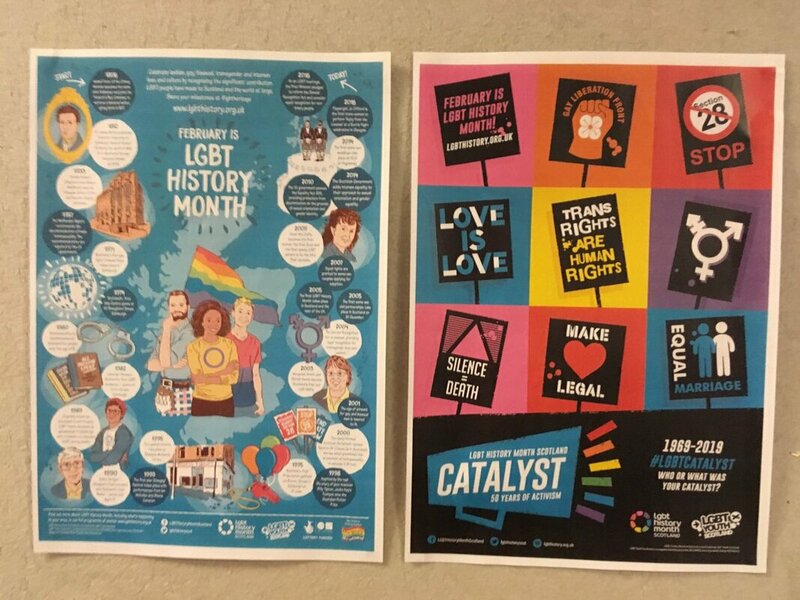 Friday 1 February - Excited for the start of LGBT history month. Posters have been put up around the school today. The committee will be running several events and assemblies throughout February. 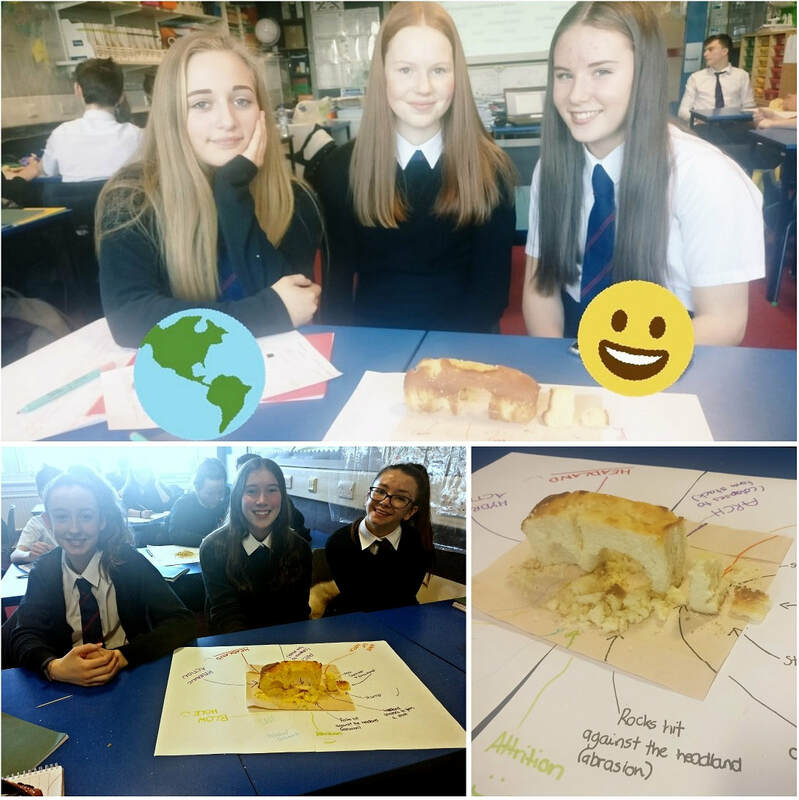 Friday 1 February - S3 Geography have been revising coastal landforms - making models of how a headland can be reduced to a stump over time, using cake. At the end of the lesson there was very swift erosion of cake happening as their models were consumed!